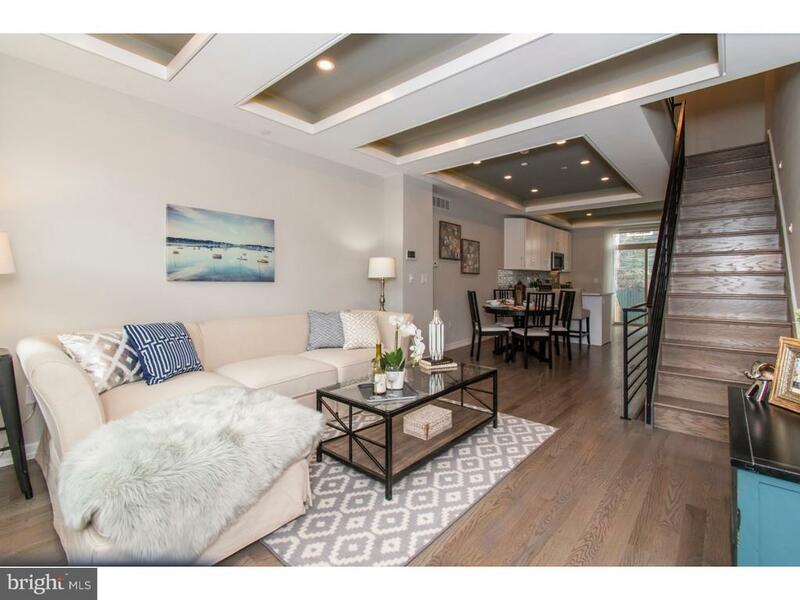 Charming new construction home with amazing roofdeck views, located in the beautiful Graduate Hospital neighborhood, just steps from the citys best parks, restaurants and bars. The main floor features coffered ceilings with accent lighting, a custom-built open staircase, as well as red oak hardwood floors stained a beautiful walnut color. The gourmet kitchen features Calcutta quartz countertops, Samsung stainless steel appliances, and a large peninsula with counter-top seating. Sliding doors take you out to the fenced-in patio, where you can enjoy your morning cup of coffee or grill on game days! Upstairs, the second floor offers two spacious bedrooms, laundry facilities boasting a full-size Samsung washer/dryer, and two nicely appointed bathrooms. Continue to the third floor, where youll find the private master suite. Coffered ceilings with accent lighting, two walk-in closets, a wet bar, and a spa-like master bath with walk-in shower make this a true sanctuary. Up one more flight, youll find the picturesque roof deck, which has unparalleled views of Center City. The fourth bedroom is located in the finished basement, and could make the perfect spot for an in-law suite, with its full bathroom, wet bar, and media room. This home has a Nest thermostat and a home audio system in the living room, master bedroom, and on the roofdeck. With its prime location in Graduate Hospital, this home is near the new Dock Street Brewery and the Frankford Chocolate Factory redevelopment project, which brings over 20, 000sf of retail space to the neighborhood. Take a peak at the New Construction Specification Sheets for more info on the construction details of the home. Schedule your showing of 2229 League Street, and prepare to fall in love! *Please note, some photos have been digitally staged* Please check OPA for 2019 taxes due to possible citywide reassessment.